Anirban Lahiri battled tough weather conditions and made the cut to end up tied-47th in the Augusta Masters. The Indian ace made the cut at T-47th. Lahiri, who shot four-over 76 in the first round, began well to be two-under through 12 holes, before three bogeys pulled him down to one-over 73 and a total of five-over 149. At that stage, he was in danger of missing the cut, which looked likely at four-over 148. However, as conditions worsened with gusty winds going upwards 20-25 miles per hour, scores began to drop and the cut finally fell at six-over 150, giving Lahiri a chance to improve upon his previous best of T-49 achieved on his debut last year. Lahiri will play his third round alongside two-time Major winner, Martin Kaymer of Germany, who shot 74-75. Fans dreaming of a Jordan Spieth v Rory McIlroy clash on Sunday will get it a day early, as Spieth stayed in lead at four-under for the sixth consecutive round at the Masters, going back to the first round of 2015 editions. Meanwhile McIlroy seeking the only Major he does not possess, is at three-under. Between the two they experienced highs and lows - If McIlroy dropped from four-under to even par and then again rose to three-under by the finish, Spieth at one time was five clear of the field, but by the end was just one ahead of McIlroy. Spieth's sudden drop also gave Bubba Watson a chance to redeem himself after twos 75s, as he made the cut on the basis of being 10 or less off the lead, apart from the Top-50 and ties. Lahiri was happy to have gotten another chance, but disappointed at the way his scoring went in the second round. He said,"It was like swimming against the tide. I don't think I did much wrong. It was just that things didn't go my way. On the 13th approach, I caught the gust and it went over, and on the 15th, I played for the wind, but it went through and over. In both cases I ended with bogeys. "I just didn't score on the Par-fives, it is something that I need to work on." He added,"I putted better on the front nine, thanÂ the back nine. On 16 and 17 I missed something like eight-footers. I have not played badly, but I have been able to score better, missing all those 8-10 footers. "Still with the wind blowing, I think the scoring is going to be tough, so let's if five-over makes it. I really want to stay on." At that time, he was still not sure as many of the players had not come in. As things finally turned out, Lahiri did make the cut, which fell at six-over. Â Lahiri, who dropped four shots in two holes - 16th and 17th - on the first day during his 76, had a great start on Friday, but once again had a rough finish. With conditions calmer in the morning, he birdied the sixth holing a 14-foot birdie. On the fifth, he holed an even bigger putt from 23 feet to go two-under, as the winds started picking up. A bogey on the fifth when he failed to get to the green in regulation saw him drop back. A great drive followed by a superb approach on 11th set him up for a five-foot birdie, which he duly nailed. But for the second day running, he struggled at the finish with bogeys on 13th, 15th and 17th to finish at 73 and five-over for the tournament. Spieth, who started the day at six-under, went to eight under with birdies on first and third, while others were either still standing where they were or slipping back as wind started picking up. ThenÂ Spieth, too, began to struggle. He dropped a double bogey on fifth, where very uncharacteristically he four-putted.Â Two more bogeys on ninth and 10th, and another two on 16th and 17th saw him come down the greased pole. Birdies on eighth and 15th limited the damage, but he slipped to four-under. McIlroy starting from two-under added birdies on second and third to move to four-under. But from there, he slipped to one-under with a double on fourth and a bogey on fifth. That deteriorated to even par with another bogey on 11th. Yet, as only McIlroy can, he picked up pieces with three birdies on 13th, 15th and 16th to get to three-under and give himself another chance at the only Major missing in his cabinet. Spieth is bidding to accomplish the rare feat of winning back-to-back Green Jackets, something done only three times -by Jack Nicklaus (1965-66), Nick Faldo (1989-1990) and Tiger Woods (2001-2002). While the rule of Top-50 and ties would have seen only 56 players, Spieth's drop to four-under gave Bubba a new lease of life for the weekend, under the rule of "10 shots off the lead'. 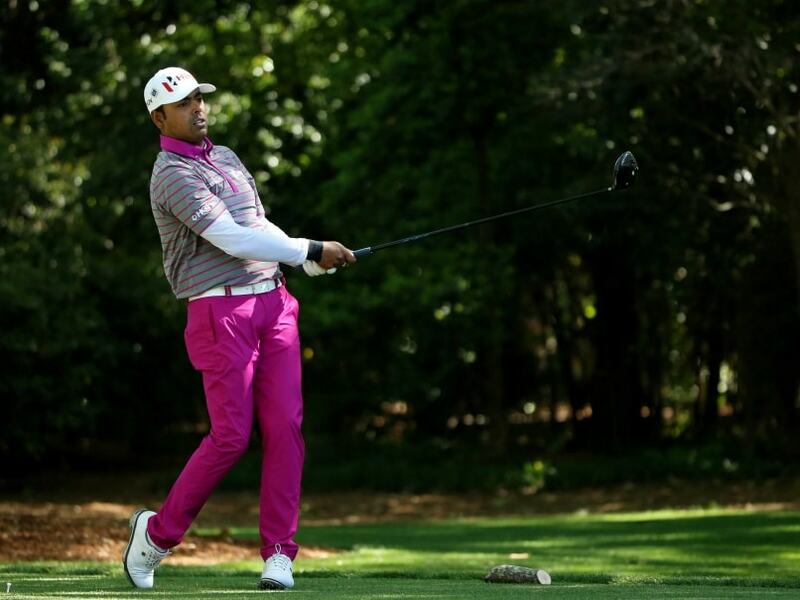 Anirban Lahiri made the cut at the Augusta Masters. Lahiri is tied in 47th place. Jordan Spieth leads the Augusta Masters ahead of Rory McIlroy.